Newcomers to Minnesota—whether they come from Kansas or Myanmar—often find that it can be a little cold in the Land of 10,000 Lakes, in more ways than one. Longtime inhabitants tend to socialize with the same people they have always known, surrounding themselves (intentionally or unintentionally) with familiar experiences and viewpoints. Even as the state ages and diversifies, there’s still precious little interaction across races, cultures, faiths, classes, and generations. 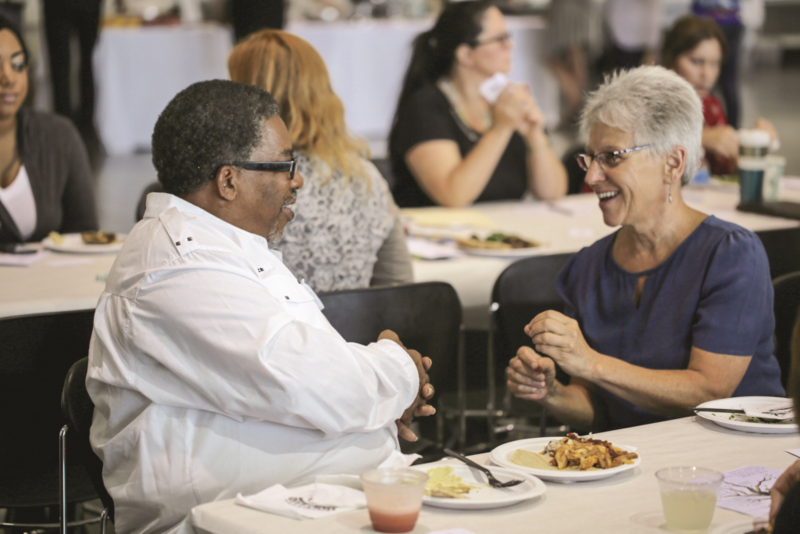 Hansen had spent two-thirds of her 30-year SRFC career working with program manager Peggy Huot-Hansen (no relation) on prevention and early-intervention initiatives, helping at-risk individuals and families navigate mental health challenges, racism, housing needs, and educational barriers. As the years had passed, the two had become increasingly convinced that for the agency to properly serve the people walking through its doors, the wider community had to be cognizant of the issues affecting its members, no matter their economic circumstance or social status. In the wake of that realization, they sought to engage as many people as possible in a more inclusive kind of interaction. Then, in 2015, Hansen got invited to a dinner at Marnita’s Table. “When we don’t know people who are different, we can be suspicious of that difference. Ultimately that contributes to the very serious problems we are now facing in our state. 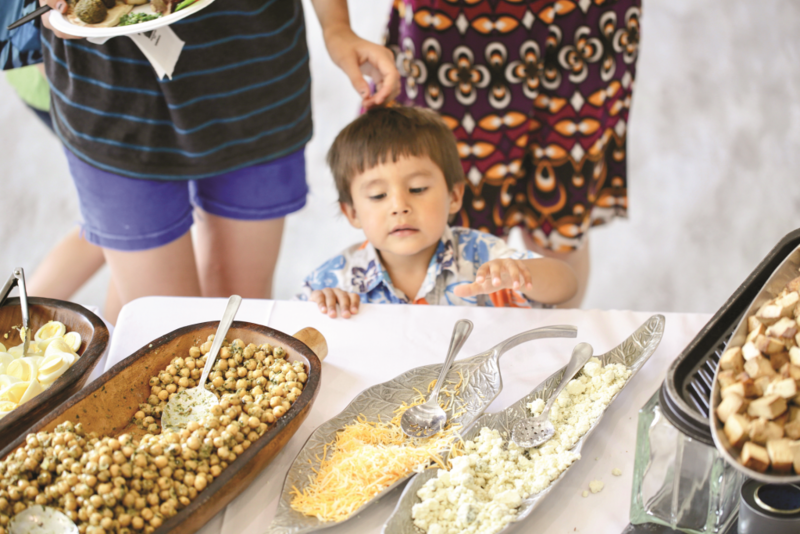 Food and family build relationships at an IZI event. Each IZI has a theme, such as education or homelessness, and the guests—as many as 150 at a time—come from a wide variety of ages, economic conditions, and cultural backgrounds. Someone greets people at the door and shows them to a table. Each table has a set of conversation-starter cards, with questions such as “Do you have a favorite tradition, holiday, or ritual?” and “What is the best advice you’ve ever received?” People sit down together, start with the questions, and then move on to more natural conversation. Inevitably, say Hansen and Huot-Hansen, people find that they have more in common than they thought. In 2017, the Citizens League launched the Calling Home initiative, designed to help people of all ages and backgrounds prepare for the needs of a rapidly aging population. As is often the case when staff at the organization look to engage different communities and community members throughout the state, they knew it would be important to find people who have deep relationships and roots in various cities, towns, and neighborhoods. Since the number of Ramsey County residents over age 65 is expected to double between 2014 and 2040, and because Hansen and Huot-Hansen are so well liked, well regarded, and well connected in the Ramsey County suburbs, they were asked to plan a series of Calling Home events. The two women’s connections, sensibilities, and experiences with IZIs paid off immediately. Not only were they able to gather a representative group of adults from the area, but they made sure to reach out to younger people too. “You have to go where the energy is, and the energy is with the youth,” explains Huot-Hansen. The two women recruited high school students to welcome attendees, serve as hosts, and even facilitate certain gatherings. Some of the kids were already integrally involved in the lives of older relatives and neighbors. For others, like Naeem Williams, a junior at Mahtomedi High School, it was a brand new experience. Amy Goetzman is a writer and editor. Her work—which focuses on the arts, culture, technology, and environmental issues—has appeared in MinnPost, Architecture Minnesota, and the Star Tribune. She lives in the suburban Ramsey area.